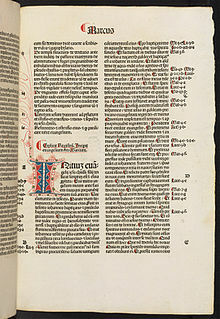 The Gospel According to Mark (Greek: Εὐαγγέλιον κατὰ Μᾶρκον, translit. 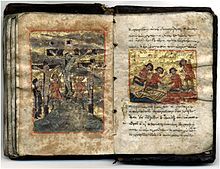 Euangélion katà Mârkon) is one of the four canonical gospels and one of the three synoptic gospels. It tells of the ministry of Jesus from his baptism by John the Baptist to his death and burial and the discovery of the empty tomb – there is no genealogy of Jesus or birth narrative, nor, in the original ending at chapter 16, any post-resurrection appearances of Jesus. It portrays Jesus as a heroic man of action, an exorcist, a healer, and a miracle worker. Jesus is also the Son of God, but he keeps his identity secret (the Messianic Secret), concealing it in parables so that even most of the disciples fail to understand. All this is in keeping with prophecy, which foretold the fate of the messiah as suffering servant. The gospel ends, in its original version, with the discovery of the empty tomb, a promise to meet again in Galilee, and an unheeded instruction to spread the good news of the resurrection. Mark probably dates from AD 66–70. Most scholars reject the tradition which ascribes it to John Mark, the companion of the apostle Peter, and regard it (and the other gospels) as anonymous, the work of an unknown author working with various sources including collections of miracle stories, controversy stories, parables, and a passion narrative. Mark was traditionally placed second, and sometimes fourth, in the Christian canon, as an inferior abridgement of what was regarded as the most important gospel, Matthew. The Church has consequently derived its view of Jesus primarily from Matthew, secondarily from John, and only distantly from Mark. It was only in the 19th century that Mark came to be seen as the earliest of the four gospels, and as a source used by both Matthew and Luke. The hypothesis of Marcan priority (that Mark was written first) continues to be held by the majority of scholars today, and there is a new recognition of the author as an artist and theologian using a range of literary devices to convey his conception of Jesus as the authoritative yet suffering Son of God. The two-source hypothesis: Most scholars agree that Mark was the first of the gospels to be composed, and that the authors of Matthew and Luke used it plus a second document called the Q source when composing their own gospels. The blue sections indicate material original to Luke and Matthew. The Gospels represent a form of Greco-Roman biography. Interpreters differ when it comes to understanding what purpose Mark had for writing the Gospel. Among some of the proposals include that Mark strictly had a theological agenda, that Mark was written in order to distance Christianity from political connotations in light of the Roman-Jewish War, or that Mark was responding to imperial Flavian propaganda. The gospels of Matthew, Mark and Luke bear a striking resemblance to each other, so much so that their contents can easily be set side by side in parallel columns. The fact that they share so much material verbatim and yet also exhibit important differences has led to a number of hypotheses explaining their interdependence, a phenomenon termed the Synoptic Problem. Traditionally, Mark was thought to be an epitome (summary) of Matthew: today, the most widely accepted hypothesis is that Mark was the first gospel (Marcan Priority) and was used as a source by both Matthew and Luke, together with considerable additional material. The strongest argument for this is the fact that Matthew and Luke agree with each other in their sequence of stories and events only when they also agree with Mark. Mark appears as the second New Testament gospel because it was traditionally thought to be an epitome (summary) of Matthew, but most scholars now regard it as the earliest written gospel. In the 19th century this led to the belief that it must therefore be the most reliable. This conclusion was shaken by two works published in the early decades of the 20th century: in 1901 William Wrede argued strongly that the "Messianic secret" motif in Mark was a creation of the early church rather than a reflection of the historical Jesus; and in 1919 Karl Ludwig Schmidt showed how the links between the episodes are the invention of the writer, thus undermining the claim that the gospel is a reliable guide to the chronology of Jesus' mission. The gospel is nevertheless still seen as the most reliable of the four in terms of its overall description of Jesus's life and ministry. Christianity began within Judaism, with a Christian "church" (or ἐκκλησία, ekklesia, meaning "assembly") that arose shortly after his death, when some of his followers claimed to have witnessed him risen from the dead. From the outset, Christians depended heavily on Jewish literature, supporting their convictions through the Jewish scriptures. Those convictions involved a nucleus of key concepts: the messiah, the son of God and the son of man, the Day of the Lord, the kingdom of God. Uniting these ideas was the common thread of apocalyptic expectation: Both Jews and Christians believed that the end of history was at hand, that God would very soon come to punish their enemies and establish his own rule, and that they were at the centre of his plans. Christians read the Jewish scripture as a figure or type of Jesus Christ, so that the goal of Christian literature became an experience of the living Christ. The new movement spread around the eastern Mediterranean and to Rome and further west, and assumed a distinct identity, although the groups within it remained extremely diverse. The gospels were written for an audience already Christian – their purpose was to strengthen the faith of those who already believed, not to convert unbelievers. Christian "churches" were small communities of believers, often based on households (an autocratic patriarch plus extended family, slaves, freedmen, and other clients), and the evangelists often wrote on two levels, one the "historical" presentation of the story of Jesus, the other dealing with the concerns of the author's own day. Thus the proclamation of Jesus in Mark 1:14 and the following verses, for example, mixes the terms Jesus would have used as a 1st-century Jew ("kingdom of God") and those of the early church ("believe", "gospel"). More fundamentally, some scholars[who?] believe Mark's reason for writing was to counter believers who saw Jesus in a Greek way, as wonder-worker (the Greek term is "divine man"); Mark saw the suffering of the messiah as essential, so that the "Son of God" title (the Hellenistic "divine man") had to be corrected and amplified with the "Son of Man" title, which conveyed Christ's suffering. (Others consider the "Son of God" title to be a predominantly Jewish title.) Some scholars think Mark might have been writing as a Galilean Christian against those Jewish Christians in Jerusalem who saw the Jewish revolt against Rome (66–73 CE) as the beginning of the "end times": for Mark, the Second Coming would be in Galilee, not Jerusalem, and not until the generation following the revolt. Jesus is first announced as the Messiah and then later as the Son of God; he is baptised by John and a heavenly voice announces him as the Son of God; he is tested in the wilderness by Satan; John is arrested, and Jesus begins to preach the good news of the kingdom of God. Jesus gathers his disciples; he begins teaching, driving out demons, healing the sick, cleansing lepers, raising the dead, feeding the hungry, and giving sight to the blind; he delivers a long discourse in parables to the crowd, intended for the disciples, but they fail to understand; he performs mighty works, calming the storm and walking on water, but while God and demons recognise him, neither the crowds nor the disciples grasp his identity. He also has several run-ins with Jewish law keepers especially in chapters 2-3. Jesus asks the disciples who people say he is, and then, "but you, who do you say I am?" Peter answers that he is the Christ, and Jesus commands him to silence; Jesus explains that the Son of Man must go to Jerusalem and be killed, but will rise again; Moses and Elijah appear with Jesus and God tells the disciples, "This is my son," but they remain uncomprehending. Jesus goes to Jerusalem, where he is hailed as one who "comes in the name of the Lord" and will inaugurate the "kingdom of David"; he drives those who buy and sell animals from the Temple and debates with the Jewish authorities; on the Mount of Olives he announces the coming destruction of the Temple, the persecution of his followers, and the coming of the Son of Man in power and glory. A woman perfumes Jesus' head with oil, and Jesus explains that this is a sign of his coming death; Jesus celebrates Passover with the disciples, declares the bread and wine to be his body and blood, and goes with them to Gethsemane to pray; there Judas betrays him to the Jews; interrogated by the high priest, he says that he is the Christ, the Son of God, and will return as Son of Man at God's right hand; the Jewish leaders turn him over to Pilate, who has him crucified as one who claims to be "king of the Jews"; Jesus, abandoned by the disciples, is buried in a rock tomb by a friendly member of the Jewish council. The women who have followed Jesus come to the tomb on Sunday morning; they find it empty, and are told by a young man in a white robe to go and tell the others that Jesus has risen and has gone before them to Galilee; "but they said nothing to anyone, for they were afraid ...."
The earliest and most reliable manuscripts of Mark end at Mark 16:8, with the women fleeing in fear from the empty tomb: the majority of recent scholars believe this to be the original ending, and this is supported by statements from the early Church Fathers Eusebius and Jerome. Two attempts were made to provide a more satisfactory conclusion. 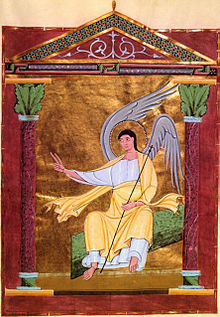 A minority of later manuscripts have what is called the "shorter ending", an addition to Mark 16:8 telling how the women told "those around Peter" all that the angel had commanded and how the message of eternal life (or "proclamation of eternal salvation") was then sent out by Jesus himself. This addition differs from the rest of Mark both in style and in its understanding of Jesus. The overwhelming majority of manuscripts have the "longer ending", Mark 16:9–20, with accounts of the resurrected Jesus, the commissioning of the disciples to proclaim the gospel, and Christ's ascension. This ending was possibly written in the early 2nd century and added later in the same century. Modern scholars have proposed many explanations for the abrupt original ending, though none with universal acceptance. It could indicate a connection to the theme of the "Messianic Secret". Whatever the case, it is clear that Mark's Jesus looks forward to a post-death meeting in Galilee, and it is likely that at that meeting, like the final meeting in Galilee that Matthew depicts, Mark's Jesus would command the disciples to take his message to the nations. Minuscule 2427 – "Archaic Mark"
The author introduces his work as "gospel", meaning "good news", a literal translation of the Greek "evangelion" – he uses the word more often than any other writer in the New Testament besides Paul. Paul uses it to mean "the good news (of the saving significance of the death and resurrection) of Christ"; Mark extends it to the career of Christ as well as his death and resurrection. Like the other gospels, Mark was written to confirm the identity of Jesus as eschatological deliverer – the purpose of terms such as "messiah" and "son of God". As in all the gospels, the messianic identity of Jesus is supported by a number of themes, including: (1) the depiction of his disciples as obtuse, fearful and uncomprehending; (2) the refutation of the charge made by Jesus' enemies that he was a magician; (3) secrecy surrounding his true identity (this last is missing from John). In Mark, the disciples, and especially the Twelve, move from lack of perception of Jesus to rejection of the "way of suffering" to flight and denial – even the women who received the first proclamation of his resurrection can be seen as failures for not reporting the good news. There is much discussion of this theme among scholars. Some argue that the author of Mark was using the disciples to correct "erroneous" views in his own community concerning the reality of the suffering messiah, others that it is an attack on the Jerusalem branch of the church for resisting the extension of the gospel to the gentiles, or a mirror of the convert's usual experience of the initial enthusiasm followed by growing awareness of the necessity for suffering. It certainly reflects the strong theme in Mark of Jesus as the "suffering just one" portrayed in so many of the books of the Jewish scriptures, from Jeremiah to Job and the Psalms, but especially in the "Suffering Servant" passages in Isaiah. It also reflects the Jewish scripture theme of God's love being met by infidelity and failure, only to be renewed by God. And in the real-world context in which the gospel was written, the persecutions of the Christians of Rome under Nero[verification needed], the failure of the disciples and Jesus' denial by Peter himself would have been powerful symbols of faith, hope and reconciliation. Mark contains twenty accounts of miracles and healings, accounting for almost a third of the gospel and half the first ten chapters, more, proportionally, than in any other gospel. In the gospels as a whole, Jesus' miracles, prophecies, etc., are presented as evidence of God's rule, but Mark's descriptions of Jesus' healings are a partial exception to this, as his methods, using spittle to heal blindness (Mark 8:22–26) and magic formulae ("Talitha cumi," 5:41, "Ephphatha," 7:34), were those of a magician. This is the charge the Jewish religious leaders bring against Jesus: they say he is performing exorcisms with the aid of an evil spirit (Mark 3:22) and calling up the spirit of John the Baptist (Mark 6:14). "There was ... no period in the history of the [Roman] empire in which the magician was not considered an enemy of society," subject to penalties ranging from exile to death, says Classical scholar Ramsay MacMullen. All the gospels defend Jesus against the charge, which, if true, would contradict their ultimate claims for him. The point of the Beelzebub incident in Mark (Mark 3:20–30) is to set forth Jesus' claims to be an instrument of God, not Satan. In 1901, William Wrede identified the "Messianic secret" – Jesus' secrecy about his identity as the messiah – as one of Mark's central themes. Wrede argued that the elements of the secret – Jesus' silencing of the demons, the obtuseness of the disciples regarding his identity, and the concealment of the truth inside parables, were fictions, and arose from the tension between the Church's post-resurrection messianic belief and the historical reality of Jesus. There remains continuing debate over how far the "secret" originated with Mark and how far he got it from tradition, and how far, if at all, it represents the self-understanding and practices of the historical Jesus. Christology means a doctrine or understanding concerning the person or nature of Christ. In the New Testament writings it is frequently conveyed through the titles applied to Jesus. Most scholars agree that "Son of God" is the most important of these titles in Mark. It appears on the lips of God himself at the baptism and the transfiguration, and is Jesus' own self-designation (Mark 13:32). These and other instances provide reliable evidence of how the evangelist perceived Jesus, but it is not clear just what the title meant to Mark and his 1st century audience. Where it appears in the Hebrew scriptures it meant Israel as God's people, or the king at his coronation, or angels, as well as the suffering righteous man. In Hellenistic culture the same phrase meant a "divine man", a supernatural being. There is little evidence that "son of God" was a title for the messiah in 1st century Judaism, and the attributes which Mark describes in Jesus are much more those of the Hellenistic miracle-working "divine man" than of the Jewish Davidic messiah. John, the last of the gospels, presents the idea that the Christ was pre-existent and became flesh as Jesus – an idea also found in Paul. Mark also calls Jesus "christos" (Christ), translating the Hebrew "messiah," (anointed person). In the Old Testament the term messiah ("anointed one") described prophets, priests and kings; by the time of Jesus, with the kingdom long vanished, it had come to mean an eschatological king (a king who would come at the end of time), one who would be entirely human though far greater than all God's previous messengers to Israel, endowed with miraculous powers, free from sin, ruling in justice and glory (as described in, for example, the Psalms of Solomon, a Jewish work from this period). The most important occurrences are in the context of Jesus' death and suffering, suggesting that, for Mark, Jesus can only be fully understood in that context. A third important title, "Son of Man", has its roots in Ezekiel, the Book of Enoch, (a popular Jewish apocalyptic work of the period), and especially in Daniel 7:13–14, where the Son of Man is assigned royal roles of dominion, kingship and glory. Mark 14:62 combines more scriptural allusions: before he comes on clouds (Daniel 7:13) the Son of Man will be seated on the right hand of God (Psalm 110:1), pointing to the equivalence of the three titles, Christ, Son of God, Son of Man, the common element being the reference to kingly power. Eschatology means the study of the end-times, and the Jews expected the messiah to be an eschatological figure, a deliverer who would appear at the end of the age to usher in an earthly kingdom. The earliest Jewish Christian community saw Jesus as a messiah in this Jewish sense, a human figure appointed by God as his earthly regent; but they also believed in Jesus' resurrection and exultation to heaven, and for this reason they also viewed him as God's agent (the "son of God") who would return in glory ushering in the Kingdom of God. The term "Son of God" likewise had a specific Jewish meaning, or range of meanings, one of the most significant being the earthly king adopted by God as his son at his enthronement, legitimising his rule over Israel. In Hellenistic culture, in contrast, the phrase meant a "divine man", covering legendary heroes like Hercules, god-kings like the Egyptian pharaohs, or famous philosophers like Plato. When the gospels call Jesus "Son of God" the intention is to place him in the class of Hellenistic and Greek divine men, the 'sons of God" who were endowed with supernatural power to perform healings, exorcisms and other wonderful deeds. Mark's "Son of David" is Hellenistic, his Jesus predicting that his mission involves suffering, death and resurrection, and, by implication, not military glory and conquest. This reflects a move away from the Jewish-Christian apocalyptic tradition and towards the Hellenistic message preached by Paul, for whom Christ's death and resurrection, rather than the establishment of the apocalyptic Jewish kingdom, is the meaning of salvation, the "gospel". All four gospels tell a story in which Jesus' death and resurrection are the crucial redemptive events. There are, however, important differences between the four: Unlike John, Mark never calls Jesus "God", or claims that Jesus existed prior to his earthly life; unlike Matthew and Luke, the author does not mention a virgin birth, and apparently believes that Jesus had a normal human parentage and birth; unlike Matthew and Luke, he makes no attempt to trace Jesus' ancestry back to King David or Adam with a genealogy. Christians of Mark's time expected Jesus to return as Messiah in their own lifetime – Mark, like the other gospels, attributes the promise to Jesus himself (Mark 9:1 and 13:30), and it is reflected in the letters of Paul, in the epistle of James, in Hebrews, and in Revelation. When return failed, the early Christians revised their understanding. Some acknowledged that the Second Coming had been delayed, but still expected it; others redefined the focus of the promise, the Gospel of John, for example, speaking of "eternal life" as something available in the present; while still others concluded that Jesus would not return at all (2 Peter argues against those who held this view). Mark's despairing death of Jesus was changed to a more victorious one in subsequent gospels. Mark's Christ dies with the cry, "My God, my God, why have you forsaken me? "; Matthew, the next gospel to be written, repeats this word for word but manages to make clear that Jesus's death is the beginning of the resurrection of Israel; Luke has a still more positive picture, replacing Mark's (and Matthew's) cry of despair with one of submission to God's will ("Father, into your hands I commend my spirit"); while John, the last gospel, has Jesus dying without apparent suffering in fulfillment of the divine plan. The Sabbath was made for man, not man for the Sabbath (Mark 2:27). [n 1] Not present in either Matthew 12:1–8 or Luke 6:1–5. This is also a so-called "Western non-interpolation". The passage is not found in the Western text of Mark. People were saying, "[Jesus] has gone out of his mind", see also Rejection of Jesus (Mark 3:21). Mark is the only gospel with the combination Mark 4:24–25, the other gospels split them up: Mark 4:24 being found in Luke 6:38 and Matthew 7:2; Mark 4:25 being found in Matthew 13:12 and 25:29, Luke 8:18 and 19:26. Parable of the Growing Seed (4:26–29). Only Mark counts the possessed swine; there are about two thousand (Mark 5:13). Two consecutive healing stories of women; both make use of the number twelve (Mark 5:25 and Mark 5:42). Only Mark gives healing commands of Jesus in the (presumably original) Aramaic: Talitha koum (Mark 5:41), Ephphatha (Mark 7:34). See Aramaic of Jesus. Only place in the New Testament Jesus is referred to as "the son of Mary" (Mark 6:3). Mark is the only gospel where Jesus himself is called a carpenter (Mark 6:3); in Matthew he is called a carpenter's son (Matthew 13:55). Only place that both names his brothers and mentions his sisters (Mark 6:3); Matthew has a slightly different name for one brother (Matthew 13:55). The taking of a staff and sandals is permitted in Mark 6:8–9 but prohibited in Matthew 10:9–10 and Luke 9:3. Only Mark refers to Herod as a king (Mk 6:14, 24); Matthew and Luke refer to him (more properly) as a tetrarch (Mt 14:1; Lk 3:19; 9:7). The longest version of the story of Herodias' daughter's dance and the beheading of John the Baptist (Mark 6:14–29). 8:14–21 – Incident of no bread and discourse about the leaven of the Pharisees. Customs that at that time were unique to Jews are explained (hand, produce, and utensil washing): 7:3–4. "Thus he declared all foods clean". [n 2] 7:19 NRSV, not found in the Matthean parallel Matthew 15:15–20. Jesus heals using his fingers and spit at the same time: 7:33; cf. Mark 8:23, Luke 11:20, John 9:6, Matthew 8:16; see also Exorcism. Jesus lays his hands on a blind man twice in curing him: 8:23–25; cf. 5:23, 16:18, Acts 6:6, 9:17, 28:8, laying on of hands. Jesus cites the Shema Yisrael: "Hear O Israel ..." (12:29–30); in the parallels of Matt 22:37–38 and Luke 10:27 the first part of the Shema (Deut 6:4) is absent. Mark points out that the Mount of Olives is across from the temple (13:3). When Jesus is arrested, a young naked man flees: 14:51–52. A young man in a robe also appears in 16:5–7, see also Secret Gospel of Mark. Mark does not name the High Priest, cf. Matt 26:57, Luke 3:2, Acts 4:6, John 18:13. Witness testimony against Jesus does not agree (14:56, 14:59). Pilate's position (Governor) is not specified, 15:1, cf. Matt 27:2, Luke 3:1, John 18:28–29. Simon of Cyrene's sons are named (Mark 15:21). A summoned centurion is questioned (Mark 15:44–45). The women ask each other who will roll away the stone (Mark 16:3), cf. Matt 28:2–7. A young man sits on the "right side" (Mark 16:5), cf. Luke 24:4, John 20:12. Mark is the only canonical gospel with significant various alternative endings (see Mark 16, Possible Scenarios). Most of the contents of the traditional "Longer Ending" (Mark 16:9–20) are found in other New Testament texts and are not unique to Mark, see Mark 16#The Longer Ending, the one significant exception being 16:18b "and if they drink any deadly thing", it will not harm those who believe, which is unique to Mark. ^ The verb katharizo means both "to declare to be clean" and "to purify." The Scholars Version has: "This is how everything we eat is purified", Gaus' Unvarnished New Testament has: "purging all that is eaten." ^ Willker, Wieland. "A Textual Commentary on the Greek Gospels. Vol. 2: Mark, p. 448" (PDF). TCG 2007: An Online Textual Commentary on the Greek Gospels, 5th ed. Archived from the original (PDF) on 27 February 2008. Retrieved 2008-01-09. ^ Boring 2006, pp. 252–53. ^ a b Boring 2006, pp. 1–3. ^ a b Perkins 1998, p. 241. ^ a b Burkett 2002, p. 156. ^ Edwards 2002, pp. 2. ^ a b c Edwards 2002, pp. 1–3. ^ Burkett 2002, p. 157. ^ France 2002, p. 5. ^ a b Williamson 1983, p. 17. ^ Roskam 2004, pp. 237-238. ^ Winn 2008, pp. 202-204. ^ Koester 2000, pp. 44–46. ^ Perkins 2009, p. 16. ^ Beaver 2009, p. 189. ^ Joel 2000, p. 859. ^ Powell 1998, p. 37. ^ a b Lössl 2010, p. 43. ^ Gamble 1995, p. 23. ^ Collins 2000, p. 6. ^ Aune 1987, p. 59. ^ a b Aune 1987, p. 60. ^ a b Aune 1987, p. 61. ^ Hurtado 2005, pp. 102-3. ^ Twelftree 1999, p. 68. ^ Cole 1989, p. 86. ^ Cole 1989, pp. 86–87. ^ France 2002, p. 11. ^ Edwards 2002, pp. 38–39. ^ Smith 1995, pp. 209–31. ^ Edwards 2002, pp. 500–01. ^ a b Schröter 2010, p. 279. ^ a b c d Horsely 2007, p. 91. ^ Edwards 2002, p. 500. ^ a b Aune 1987, p. 17. ^ Morris 1990, p. 95. ^ a b Aune 1987, p. 55. ^ Donahue 2005, pp. 33–34. ^ Twelftree 1999, p. 57. ^ a b Kee 1993, p. 483. ^ Powell 1998, p. 57. ^ Welch 2006, p. 362. ^ a b Aune 1987, p. 56. ^ Cross & Livingstone 2005, p. 1083. ^ Telford 1999, p. 3. ^ Telford 1999, pp. 38–9. ^ a b c d Telford 1999, pp. 38–39. ^ Donahue 2005, p. 25. ^ Ehrman 1993, p. 74. ^ Burkett 2002, pp. 68–69. ^ a b Donahue 2005, pp. 25–26. ^ Edwards 2002, p. 250. ^ Witherington 2001, p. 51. ^ Donahue 2005, pp. 26–27. ^ Witherington 2001, p. 52. ^ Burkett 2002, p. 69. ^ a b Telford 1999, p. 155. ^ Dunn 2003, pp. 709–10. ^ a b Strecker 2000, pp. 81–82. ^ Dunn 2003, p. 69. ^ Telford 1999, p. 52. ^ Hurtado 2005, p. 587. ^ a b c Burkett 2002, p. 158. ^ Burkett 2002, pp. 69–70. ^ a b Moyise 2013, p. unpaginated. ^ Twelftree 1999, p. 79. Aune, David E. (1987). The New Testament in its literary environment. Westminster John Knox Press. ISBN 978-0-664-25018-8. Beaver, Caurie (2009). Mark: A Twice-Told Story. Wipf and Stoc. ISBN 9781608991211. Brown, Raymond E. (1997). An Introduction to the New Testament. Doubleday. ISBN 978-0-385-24767-2. Cole, R. Alan (1989). The Gospel According to Mark: An Introduction and Commentary (2 ed.). Wm. B. Eerdmans Publishing. ISBN 978-0-8028-0481-5. Cross, Frank L.; Livingstone, Elizabeth A., eds. (2005) . "Messianic Secret". The Oxford Dictionary of the Christian Church (3 ed.). Oxford University Press. p. 1083. ISBN 978-0-19-280290-3. Donahue, John R. (2005) . The Gospel of Mark. Liturgical Press. ISBN 978-0-8146-5965-6. Dunn, James D.G. (2003). Jesus Remembered. Wm. B. Eerdmans Publishing. ISBN 978-0-8028-3931-2. Dunn, James D.G. (2005). "The Tradition". In Dunn, James D.G. ; McKnight, Scot. The Historical Jesus in Recent Research. Eisenbrauns. ISBN 9781575061009. Edwards, James (2002). The Gospel According to Mark. Wm. B. Eerdmans Publishing. ISBN 978-0-85111-778-2. Ehrman, Bart D. (1993). The Orthodox Corruption of Scripture: The Effect of Early Christological Controversies on the Text of the New Testament. Oxford University Press. ISBN 978-0-19-510279-6. Ehrman, Bart D. (1 May 2006). Peter, Paul and Mary Magdalene: The Followers of Jesus in History and Legend. Oxford University Press. pp. 6–10. ISBN 978-0-19-974113-7. France, R.T. (2002). The Gospel of Mark: A Commentary on the Greek text. Wm. B. Eerdmans Publishing. ISBN 978-0-8028-2446-2. Horsely, Richard A. (2007). "Mark". In Coogan, Michael David; Brettler, Marc Zvi; Newsom, Carol Ann. The New Oxford Annotated Bible with the Apocryphal/Deuterocanonical Books: New Revised Standard Version. Oxford University Press. pp. 56–92 New Testament. ISBN 978-0-19-528881-0. Hurtado, Larry W. (2005) . Lord Jesus Christ: Devotion to Jesus in Earliest Christianity. Wm. B. Eerdmans Publishing. ISBN 978-0-8028-3167-5. Joel, Marcus (2000). Eerdmans Dictionary of the Bible. Eerdmans. ISBN 9789053565032. Kee, Howard Clark (1993). "Magic and Divination". In Coogan, Michael David; Metzger, Bruce M. The Oxford Companion to the Bible. Oxford University Press. pp. 483–84. ISBN 978-0-19-504645-8. Koester, Helmut (2000) . Introduction to the New Testament: History and literature of early Christianity (2 ed.). Walter de Gruyter. ISBN 978-0-567-16561-9. Lincoln, Andrew (2004). "Reading John". In Porter, Stanley E. Reading the Gospels Today. Eerdmans. ISBN 9780802805171. Malbon, Elizabeth Struthers (2000). In the Company of Jesus: Characters in Mark's Gospel. Westminster John Knox Press. ISBN 9780664222550. Morris, Leon (1990) . New Testament Theology. Zondervan. ISBN 978-0-310-45571-4. Moyise, Steve (2013). Introduction to Biblical Studies. Bloomsbury. ISBN 9780567189264. Perkins, Pheme (1998). "The Synoptic Gospels and the Acts of the Apostles: Telling the Christian Story". In Barton, John. The Cambridge companion to biblical interpretation. Westminster John Knox Press. pp. 241–58. ISBN 978-0-521-48593-7. Perkins, Pheme (2009) . Introduction to the Synoptic Gospels. Wm. B. Eerdmans Publishing. ISBN 978-0-8028-6553-3. Powell, Mark Allan (1998). Jesus as a Figure in History: How Modern Historians View the Man from Galilee. Wm. B. Eerdmans Publishing. ISBN 978-0-664-25703-3. Reddish, Mitchell (2011). An Introduction to The Gospels. Abingdon Press, 2011. ISBN 9781426750083. Roskam, H.N. (2004). The purpose of the Gospel of Mark in its historical and social context. Brill. ISBN 9789047413943. Schröter, Jens (2010). "The Gospel of Mark". In Aune, David E. The Historical Jesus: A Comprehensive Guide. Wiley–Blackwell. pp. 272–95. ISBN 978-1-4051-0825-6. Smith, Stephen H. (1995). "A Divine Tragedy: Some Observations on the Dramatic Structure of Mark's Gospel". Novum Testamentum. E.J. Brill, Leiden. 37 (3): 209–31. doi:10.1163/1568536952662709. JSTOR 1561221. Telford, William R. (1999). The Theology of the Gospel of Mark. Cambridge University Press. ISBN 978-0-521-43977-0. Welch, John W. (2006). "Miracles, Maleficium, and Maiestas in the Trial of Jesus". In Charlesworth, James H. Jesus and Archaeology. Wm. B. Eerdmans Publishing. ISBN 978-0-8028-4880-2. Williamson, Lamar (1983). Mark. John Knox Press. ISBN 9780664237608. Winn, Adam (2008). The purpose of Mark's gospel. Mohr Siebeck. ISBN 9783161496356. Witherington, Ben (2001). The Gospel of Mark: A Socio-rhetorical Commentary. Wm. B. Eerdmans Publishing. ISBN 978-0-8028-4503-0. Brown, Raymond E. (1994). An Introduction to New Testament Christology. Paulist Press. ISBN 978-0-8091-3516-5. Crossan, John Dominic (2010) . The Birth of Christianity: Discovering What Happened in the Years Immediately After the Execution of Jesus. HarperCollins. ISBN 978-0-06-197815-9. Ehrman, Bart D. (2005). Misquoting Jesus. Harper Collins. ISBN 978-0-06-085951-0. Ehrman, Bart D. (2009). Jesus Interrupted. Harper Collins. ISBN 978-0-06-117394-3. Ladd, George Eldon (1993). A Theology of the New Testament. Wm. B. Eerdmans Publishing. ISBN 978-0-8028-0680-2. Lane, William L. (1974). The Gospel According to Mark: The English Text with Introduction, Exposition and Notes. Wm. B. Eerdmans Publishing. ISBN 978-0-8028-2502-5. Levine, Amy-Jill (2001) . "Visions of kingdoms: From Pompey to the first Jewish revolt". In Coogan, Michael D. The Oxford History of the Biblical World. Oxford University Press. ISBN 978-0-19-513937-2. Mack, Burton L. (1994) . The Lost Gospel: The Book of Q and Christian origins. HarperCollins. ISBN 978-0-06-065375-0. Perrin, Norman; Duling, Dennis C. (1982). The New Testament: An Introduction (2 ed.). Harcourt Brace Jovanovich. ISBN 978-0-15-565726-7. Theißen, Gerd; Merz, Annette (1998). The Historical Jesus: A Comprehensive Guide. Augsburg Fortress. ISBN 978-0-8006-3123-9. Van Linden, Philip (1992) . "Mark". In Karris, Robert J. The Collegeville Bible Commentary: New Testament, NAB. Liturgical Press. pp. 903–35. ISBN 978-0-8146-2211-7. Weeden, Theodore J. (1995). "The Heresy that Necessitated Mark's Gospel". In Telford, William. Interpretation of Mark. Continuum. ISBN 978-0-567-29256-8. Wikimedia Commons has media related to Gospel of Mark. An Online Textual Commentary on the Greek Gospels by Wieland Willker, including detailed text-critical discussion of the 300 most important variants of the Greek text (PDF, 411 pages) and the variant endings (PDF, 17 pages).